Airfix has been making military figures and vehicles for quite some time. Up until now, they've just been for building and painting purposes only. Well, I mean, you could potentially substitute them into a miniatures game if you wanted, but they were designed to be built and admired. Well, soon they'll have their own miniatures game that they can be used for, as Modiphius is currently taking pre-orders for the new Airfix Battles Indroductory Wargame. 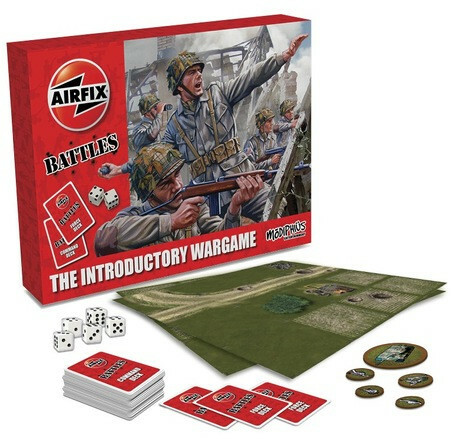 The new game is set is WWII (as would be expected with Airfix's inventory of figures) and is designed to be a quick, easy-to-learn, easy-to-play miniatures game for two players. The initial box will come with cardboard counters for various tanks and infantry, so even if you don't have any Airfix models (or just not the right collection to play), then you don't have to go out and buy extra to learn the game. Those that pre-order will also get extra bonuses. There will be a pdf campaign that goes along with the game. They will also get Reinforcement Pack 1, which gives you extra units and tanks (such as the King Tiger and Sherman Calliope launcher). Pre-orders will start shipping out in early May.